For weeks, I had been collecting inspiration pictures for redoing our basement stairs. What I finally pictured was a beautiful staircase with gorgeous dark stained treads, gleaming white risers and lilting teal blue stenciled designs. Then reality happened. We started with this lovely carpet covering each stair. Classic Seventies. Original. Chosen by the previous owner. What can I say? Basement stairs have been low priority. Wheels ripped it off and I began unstapling the pads and prying up the old tack strips. This was what I found beneath the carpet. Not pretty. Not pretty at all. I know the wallpaper is ugly and really strange, too. Does it help if I tell you that the previous owner also chose it? I didn’t think so. In fact, now you know we have been living with this nautical disaster for and did not remove it while the engine was still hot on the moving van! Basement stairs have been low priority. But now I have a plan, a vision and soon we will have a gorgeous dark stained and white staircase with swirling stencils. Then reality hit. The stairs were full of knots and the wood was very rough. There were wide gaps between the tread and the riser. And the wall. There were gouges and nail holes. Smoothing them out would take a lot of work, filling and sanding. Stain on top of that would likely be very uneven and spotty. The goal became smooth dark gray enamel treads. With gleaming white risers. And sweeping stencils. Oh. Did I mention the bare stairs were noisy? 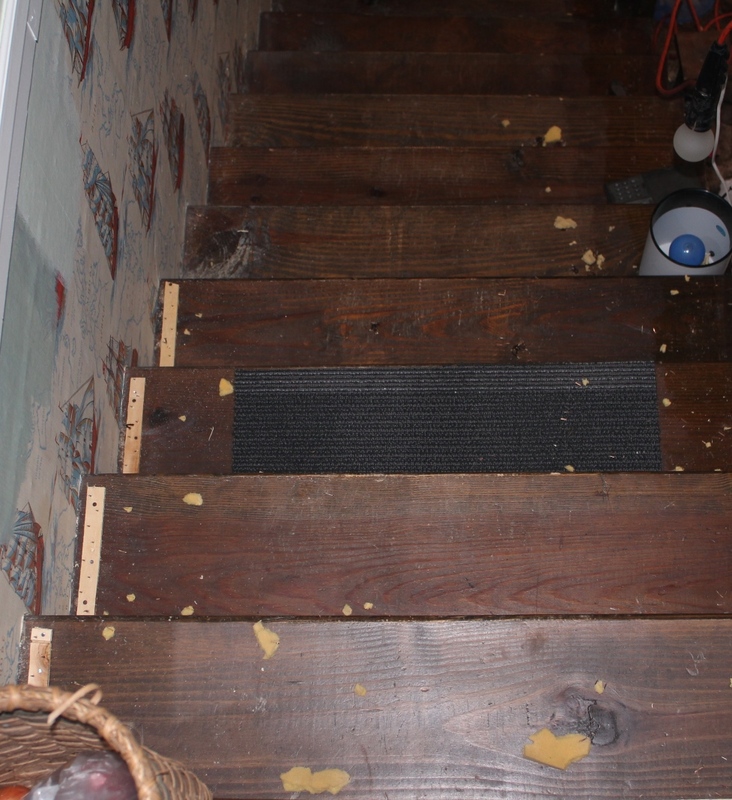 The carpet had muffled all the squeaks and squawks of an old staircase with some warped boards. Carpet had also muffled the noise of the water heater that sets almost under the top of the stairs. It also had muffled the sounds of heavy shoes on the bare wood. Clomp, clomp, clomp. Someone always found a need to go up and/or down the staircase while someone else was on the phone in the office where the door to the basement is located. Clomp, clomp,clomp. “Excuse me — there was some interference on the line — I’m so sorry. . .” Clomp, clomp, clomp. Down to the freezer — the laundry — storage — the treadmill — craft space — clomp,clomp, clomp. Wheels added screws to each step and riser at strategic points to tighten the wood joins. That also helped quiet the squeaks and squawks. I filled the nail holes, knot holes and gouges, then sanded. Caulked the gaps between treads and risers and the wall. That helped muffle the hot water heater fan and the sound of the burner since the water heater was located almost under the staircase. We reached a point where I could finally paint. That gorgeous dark gray paint that was supposed to go on the treads? Well, it made the unlighted staircase positively cavelike. Imagine what the dark stain would have done! Okay, I’ll paint everything gleaming white. 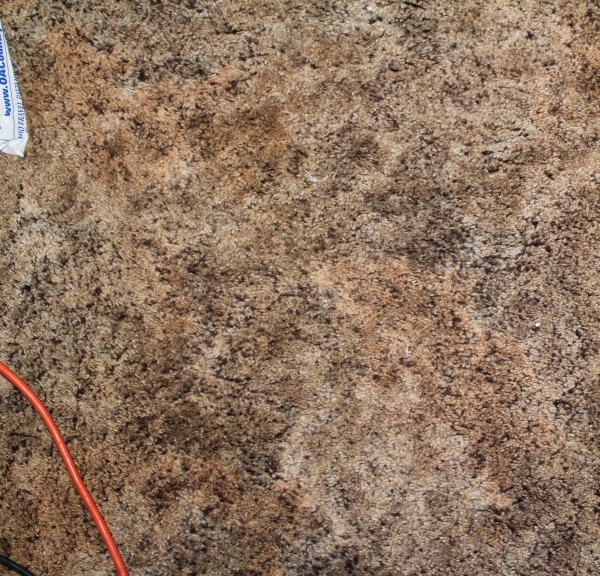 Do you know what work boots, sneakers, black dress shoes and any other shoe sole does to white paint? Treads. And prints. There were tread marks and shoe prints all over the gleaming white. Okay. Light gray it is. The color really did brighten up the space and made it seem much larger. Shoe marks were still somewhat visible, but not so bad. Tread and riser both are painted light gray. No delicious dark stain. No gleaming white. But there will still be sweet leafy stencils. You wouldn’t believe how easy this is! Or how simple! Or how quickly it can be done! 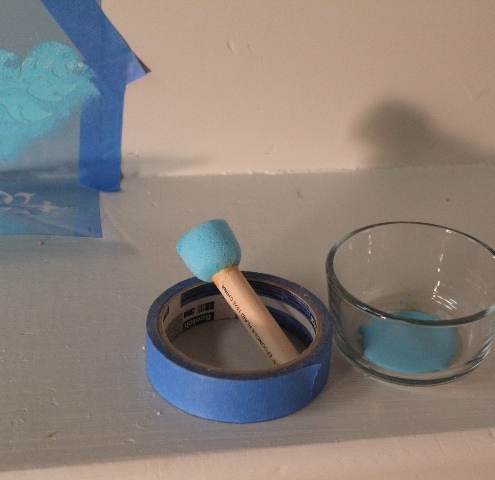 All it takes is a plastic stencil, painter’s tape, craft paint in your choice of color and a cute little dauber. 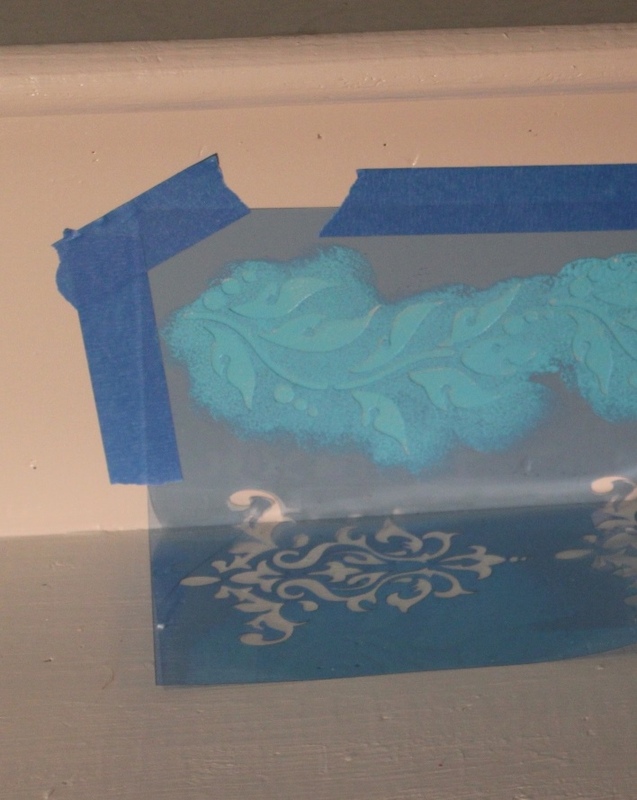 Don’t put a lot of paint on the dauber, pounce it gently on the openings in the stencil. Carefully remove the stencil when done. Gorgeous! And you feel so crafty and creative. But then you realize there is a strange and very heavy odor at the head of the stairs. The almost elderly cat has trouble getting down those bare stairs. She begins to avoid them altogether and the heavy odor locates itself somewhere else. The litter box is in the basement laundry room. Now the reasons to clomp, clomp, clomp down the stairs include carrying a yowling cat. And every day I am wiping down these stairs with a damp cloth to remove the tread marks and dust that make the stairs look dark, dingy and unkempt. 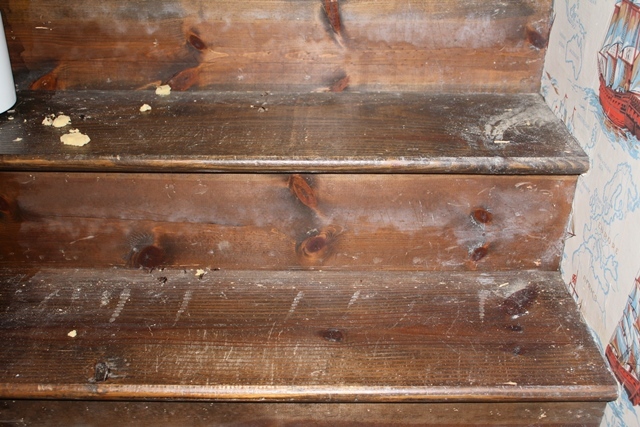 Questions to consider in deciding how to finish stairs: 1) What kind of physical condition are the stairs? 2) Can the family pet (or all family members) navigate bare stairs? 3) How frequently do humans use the stairs during the day? 4) How loud and how distracting is the noise of people going up and down the stairs? 5) Is the planned finish easy to maintain and keep clean? 6) What effect does the chosen color have on the space? 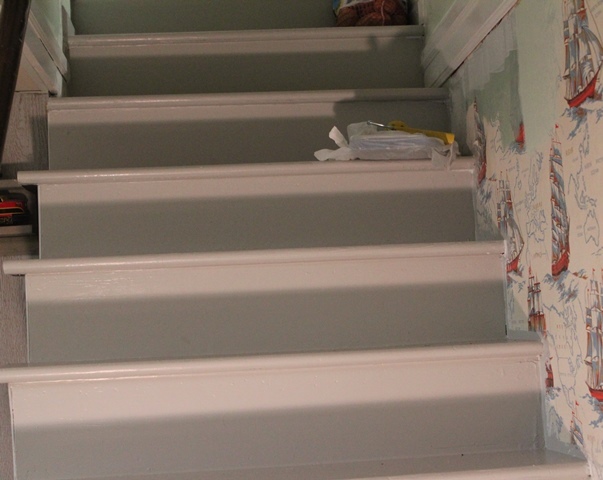 I stenciled two stair risers. They are lovely. Next week — the results. Not quite the staircase vision I had in mind. Picture frame makeover -- try, try again! Those are all very important considerations – especially the convenience of the cats being able to navigate steps to their litter box. I was just thinking of ripping the carpet from our steps and now I’m thinking maybe I’ll just replace it. 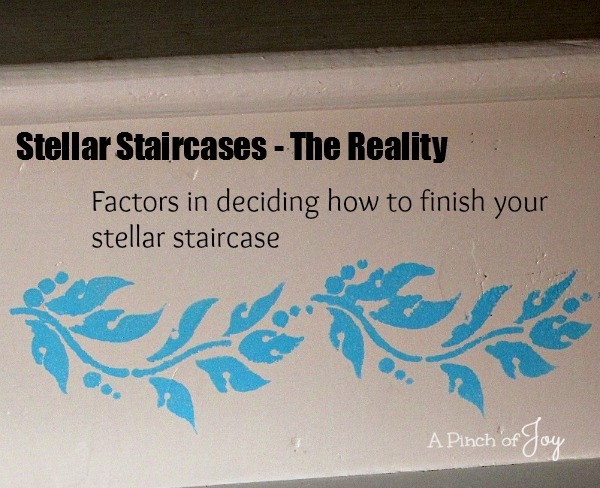 Painted steps look beautiful, especially with the stencil, but all the points you mention need thought. Thanks!